Hellboy Gets Thomas Haden Church as Lobster Johnson? Thomas Haden Church is reportedly portraying Lobster Johnson, aka the Lobster in the Hellboy reboot. Mike Mignola created the character in 1993 for the comics and he was first seen on the small screen in the second animated Hellboy film, Blood and Iron. Hellboy fans were hoping that the footage that was shown at NYCC would hit the internet straight afterwards, but sadly, that has not been the case. Reactions to the footage were overwhelmingly positive, hyping fans that weren’t able to make it out to this year’s NYCC. With that being said, the first trailer should be dropping soon. 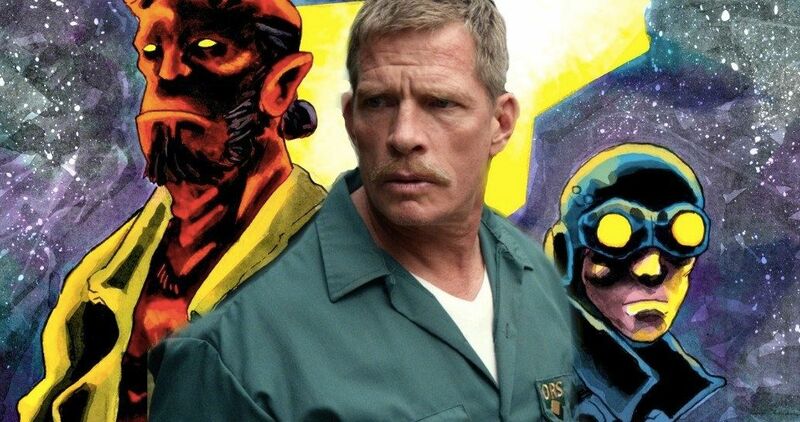 Thomas Haden Church recently spoke about comic book movies. In an interview from earlier this year, the actor was asked about making a return to the superhero genre after appearing as Sandman in Spider-Man 3. Church revealed that he actually had just filmed for a new secret superhero movie. He explains. Now, according to Discussing Film, Thomas Haden Church is officially on board for the Hellboy remake as Lobster Johnson. It’s not clear where their getting their info, but they sure seem pretty confident about it. The site then gives a description of the character, noting his “reputation for violence and burning his trademark lobster claw symbol into foreheads.” Again, the inclusion of the vigilante has not been officially confirmed by anyone at this time, although the Wikipedia page for Lobster Johnson says that he will be in the reboot, but that can be edited by anybody at any time. Lobster Johnson was a vigilante in the 1930s who killed mobsters. In the modern era, people believe that he was a fictional character who was created by a retired detective turned pulp author. However, he was a real man in the comics who faced gangsters and paranormal threats. Lobster Johnson often helps out the BPRD, after death, and battles ghosts and demons. The character was supposed to appear in Hellboy II: The Golden Army, but was not included because Mike Mignola wanted to keep his origin story intact. Guillermo del Toro also had plans to include Lobster Johnson in Hellboy 3, but that movie obviously isn’t happening any more. The casting news has yet to be confirmed by Thomas Haden Church, but it’s easy to see him playing a character like that, and fans have been waiting to see the character for quite a while. For now, we’re just going to have to wait and see. The Hellboy reboot casting news was first reported by Discussing Film.